When we heard that there's a product available that can give us the extra-large ears we've always wanted, we said "ooh tell us more." We've always had a weird obsession with pointed ears since we were children with dreams of becoming one of Santa's hardworking elves. We've even made appointments with surgeons to see if they can take skin from other parts of our body and attach it to our ears, making them larger, pointier, and overall better. Weird, we know, but large ears make us happy. 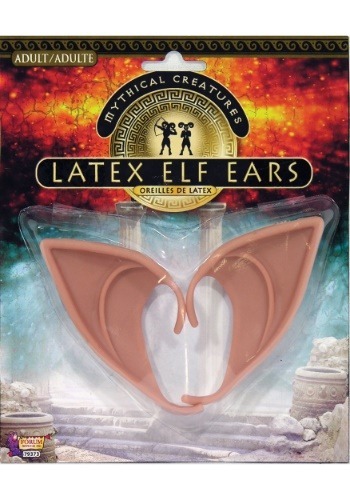 Luckily these big elf ears came into the office and changed our lives for the better. Finally, a way to make our lifelong dream come true! This fun accessory is constructed from latex so they mimic the look and feel of real skin. Fasten them to yourself by hanging them on the outer part of your ear. No glue, tape, or makeup necessary! Not only do these elf ears enhance all kinds of adult elf costumes, but you can also pair them with a variety of other costumes for a more believable transformation this Halloween. This accessory is great for all kinds of mythical creature costume. Pair them with a fairy or a Vulcan costume too.